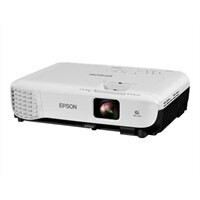 Epson VS250 Office Projector - Portable ProjectorMake a lasting impression with the VS250 portable projector, offering 3,200 lumens of color/white brightness1 for vivid presentations — even in well-lit rooms. Featuring SVGA resolution (800 x 600), the VS250 is ideal for everyday projection needs. Its lightweight design and fast, easy setup tools get you up and running in no time. Plus, Epson® 3LCD projectors deliver remarkable color accuracy, with up to 3x Higher Color Brightness2 and up to 3x Wider Color Gamut3 over competitive DLP projectors. The VS250 also supports HDMI, the standard in digital connectivity, for compatibility with the latest laptops and media players. Make a lasting impression with the VS250 portable projector, offering 3,200 lumens of color/white brightness1 for vivid presentations — even in well-lit rooms. Featuring SVGA resolution (800 x 600), the VS250 is ideal for everyday projection needs. Its lightweight design and fast, easy setup tools get you up and running in no time. Plus, Epson® 3LCD projectors deliver remarkable color accuracy, with up to 3x Higher Color Brightness2 and up to 3x Wider Color Gamut3 over competitive DLP projectors. The VS250 also supports HDMI, the standard in digital connectivity, for compatibility with the latest laptops and media players.